Almost every person in the world who mostly pays for hospitalization bills from out of his/her pocket knows that health should be a priority in life. Illnesses and accidents are not picky. These can happen to anyone. And the damages, not only to the state of the person but also to the financial status and the well-being of the whole family, should be minimized. Hence, some governments look for ways to help the people it governs manage their health and wellness. Especially for a country like the Philippines, the home of one of the most hygienic people in the world, people hate getting into accidents, being afflicted with diseases, or losing someone to year-long battles. It's just too costly --- physically and mentally. Although unwanted circumstances like accidents and deaths bring Filipino families together, these are just not the way Pinoys would want to be reunited with their loved ones. The Philippine government has steadily sustained its health programs that aim to cover everyone and not just the poor. The Philippine Health Insurance Corporation, PhilHealth, is a tax-exempt government-owned and and government-controlled corporation (GOCC) which was tasked to provide a national health insurance program for all. The presence of PhilHealth clearly defines the notion that the healthy is capable of paying for the sick and the wealthy, the fortunate can subsidize those who can't, as well as all contributors are assured a healthcare safety net. The PhilHealth categorizes contributors into different groups, namely formal (employed), indigent , retiree, non-formal, and OFW. Except for outpatient primary care which only applies to indigents and OFWs, all beneficiaries can avail of the following services at lower (subsidized) fees: catastrophic coverage, inpatient care, catastrophic coverage, ambulatory surgeries, outpatient treatment for malaria and tuberculosis, and maternal deliveries. Please visit the PhilHealth website for a complete list of the healthcare benefits. This 2016, PhilHealth released its table of premium contributions (seen below) which serves as the basis of all PhilHealth contributions of the employed, self-employed, OFWs, sponsored, and individual paying members. For those who are employed, 50% of the contribution, which depend on their salary bracket, will come from their employer. 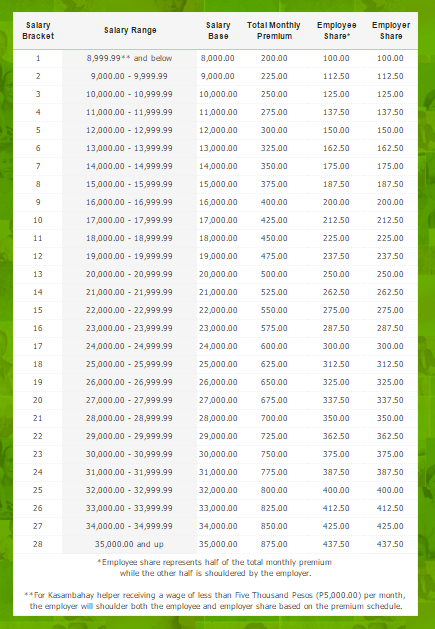 There are 28 salary brackets (ranging from a monthly salary of 8,999.99 Php or lower, to a highly 35,000 Php) in the PhilHealth contribution table, each with a different premium to be paid. Based on the table of monthly premiums, "Kasambahay" or household helps who receive a monthly salary of less than 5,000 Php will have their contributions fully shouldered by their employer. For all land-based Overseas Filipino Workers (OFWs), they have the choice to pay their premium either annually (2,400 Php) or semi-annually (1,200 Php). For all self-employed and individually paying members who have monthly income of P25,000 and below, they will pay an annual premium of 2,400 Php. Meanwhile, those who earn more than P25,000 monthly will have to pay 3,600 Php per year. Payments can also be done semi-annually or quarterly. Those under the Sponsored Program category, their annual premium of 2,400 Php will be partially or fully subsidized by their respective sponsors (could be an LGU, private entity, legislator or a national government agency). It is that period of the year again when the spotlight is turned towards the Philippines’ best beaches and mesmerizing islands. Start your vacation by getting sun-kissed in the sand. Visit the country's best summer getaways. This summertime season will definitely give us the opportunity to explore, discover, and gain new experiences. Start your vacation right by planning as early as now. Find the perfect place for you to celebrate the hot days of summer! This list of eight (8) great summer Philippine summer destinations will definitely help you come up with your escapade itinerary. Before 2014 ended, the resort of San Rafael River Adventure in Bulacan was opened to the public. And since then, this has been the perfect destination for people not just looking to spend one epic summer adventure, but even to those looking to experience nature, serenity and romance in one place. If you want to relax, spend some quality time with your family, escape the stresses of the city, and even be with your one and only in privacy, we definitely encourage you to place this on your list of PH summer destinations to check out this summer. You will see an infinity pool with an astonishing view and enjoy water sports activities just like paddle board, jet ski, kayaking, etc.). It is a fact that beaches and swimming pools are the traditional choices, but San Rafael River Adventure gives you a one-of-a-kind experience. Take a break from pressure, stress and anxiety. Explore Nogas island and wallow in Anini-y’s hot springs. This is one of Antique’s famous destinations. With its complete facilities, guests can enjoy this inviting paradise in Western Visayas. Nogas Island is located in Anini-y, Antique. With is its lovely, private 24-hectare spot, this is just about a 15-minute boat journey from the town’s seashore. A sure natural reserve, it is ideal for swimming, diving, and early morning strolling along its pristine white-sand beach. Want to know more about this travel-worthy place? Check out a traveler's experience here. We've shown you a preview of resorts to check out north of Metro Manila and south in Antique province. Let us now take you to Albay in the far east side of the country. A high-class hideaway constituting 37 Asian-inspired villas, Misibis Bay gives you an extraordinary, unusual, extravagant, and enchanting experience in a paradise that boasts of a spa, an outdoor pool, worth visiting restaurants (Tapas Bar, Dela Playa Beach Grill), a private beach, a gym, and a wide array of activities such as thrilling water sports events like parasailing, diving with whale sharks, and windsurfing, and trekking Mayon Volcano on an ATV. Misibis Bay is your luxury island offering outdoor play area in the Philippines. It's a private tropical sanctuary built on a pristine section of the southern beach portion of Cagraray island in Bacacay, Albay. True to being a national park, Halea serves as a haven to countless sea species because of its rich ecosystem. Because of the protection and security it gets, the area has successfully preserved its beauty inviting tourists from all over the world to experience the tranquility it can offer. It is so captivating that the residents themselves could not get enough of this paradise. Professional surfers and surfer-wannabes take the journey to Baler in Aurora and prepare for their ride with the big waves. And this, without any doubt, is true and proven because Sabang Beach is a surfer’s ideal place to be. 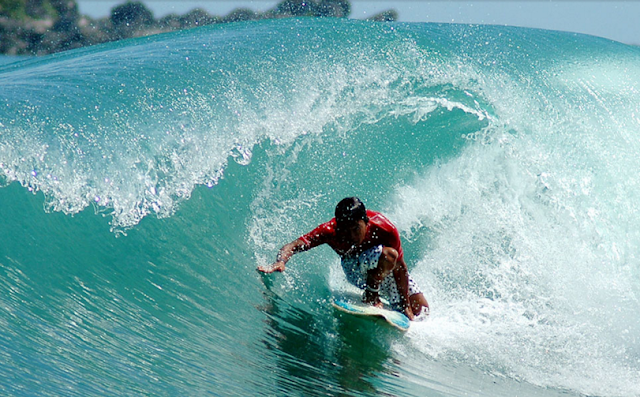 But more that the surfing itself, the town is progressively popular not only to surfing fanatics and lovers, mainly because of its natural splendor, historical importance and other attractions such as Ditumabo Falls, Diguisit Rock Formations, Baler Catholic Church, and Museum de Baler. Nope. We're not referring to Subic Bay in Zambales. This one's in Sorsgon! Subic Beach is a gem that's yet to be known by the travel horde. From the port of Matnog, as you move closer to Subic Beach, you will be amazed at its pinkish sand that's due to crushed reddish corals that have collected in the sand. 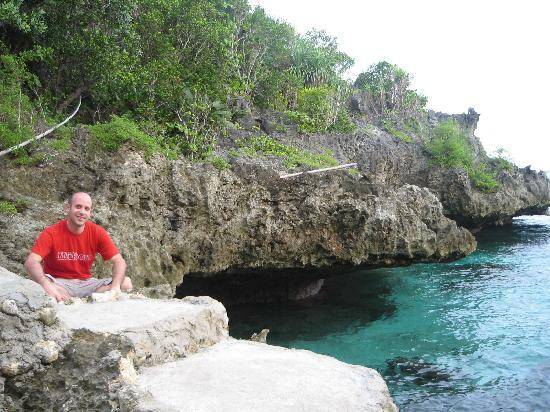 You will also be inspired by its clear blue waters which allows you to see through the coral formations below. If you wish to momentarily isolate yourself from the rest of modern civilization, just troop to this wonderful hideaway. Check out one traveler's experience in Subic Beach here. This place brags of two main tourist must-dos that everyone would surely love – walking along the white sand of Mahabang Buhangin and swimming in the pristine blue Pacific waters, any of which soothes headaches and eases broken hearts. Since it is less visited and commercialized versus other crowded beaches like Boracay, the isle serves as a perfect escapade for individuals longing for privacy. If you are the type of traveler who just want to get away from the demanding, busy life of the city, take a few moments to immerse yourself in the beauty of Calaguas and let all the stress fade away. Eskaya Beach Resort and Spa is a commendable spa resort located in Panglao Island, just at the southernmost tip of Bohol, which is famed for the wide-eyed tarsier and for its enticing Chocolate Hills.. Placed halfway through Panglao along its coast opposite the Bohol Sea, it is a sprawling property covering almost 16 hectares of land with a varied geography. It has a slowly descending cliff, a ravine, flat land, caves, and an impressive view of the sea. The resort is home to a stylish boutique establishment and reflects Filipino crafts and architecture. Its single-detached villas called “balai” are made with durable native materials including bamboo, wood, and cogon. A lot of these "balai" have private swimming pools in it. The resort's main attraction, however, is the infinity pool which gives a relaxing view of the sea. Do check out its spacious and vibrant restaurant --- Lantawan Restaurant. You may even dine at the beach al fresco style, in the garden, or by the poolside. There are just so much more to discover, lots of things to do, numerous places to visit, and unlimited number of memories to make this summer. Be with the people you love. Travel alone. Meet new people. Go on challenging trips. Enjoy the summer heat. Unwind and just have fun in the Philippine, for it has a lot to offer! These are just some of the best places to visit this summer! In life, there are cases where you get too preoccupied mentally that you sometimes end up doing your work inefficiently or end up getting lazy and unproductive. Sometimes, you find it struggling to stick with them simply because you just couldn't get it over with. Initially, you have your goals set. But then, bit by bit, you work on it. And as you go on, you realize that you're bored of performing the same thing over and over again. And then you stop. And then you come up with another goal that you'd like to accomplish, but eventually, you lose focus and then you stop again. And the cycle goes on and on. The thing is you always tell yourself that, once you're already doing something, you can take a pause, do it later, and unintentionally procrastinate. Your mental endurance might just be not that strong as compared to those who can do the job within the time frame they've set themselves into. The lack of focus and concentration is oftentimes the reason all your plans don't turn into actions. Don't worry. It happened to me before all the time --- from blogging and working, to studying and finishing my papers. But how do I stay focused? There is a need for clarity as to what result you would like to achieve when you want to focus on your goals. Concentration is when you stick with the task until it is 100 percent complete. For example, a would-be singer would focus on hitting the right notes in order to make sure she sings well any song that fits her voice. But a singer would have to work on it for hours and hours so as to get it right. She needs to concentrate on her main focus, that is ensuring she sings the way she expects her to. Another scenario would be that of a photographer who adjusts his lens for him to be able to capture sharp images. And then, he sticks with it making sure all day long until he's satisfied with his result. The video you see below highlights two of the most important habits of successful people. Make sure you watch it, after reading this post. It will help you, pramis! Be sure that what you're working on is the most significant thing you could be doing, at the moment, to get what you want. So what makes a successful person? Successful people always keep in mind that they must work in a straight, clear line to go from where they are to where they want to be. If you want to reach your dreams, you must be sure that everything you do is taking you in that direction. Once you're sure of the path to take, regardless if it's the common way or not, you then develop good habits that would accompany you in your path and take you there. 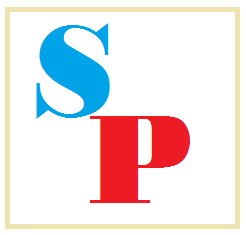 When I was starting Spotlight Philippines, Manila LifeBox's sister website, my dream was just to practice my poor writing skills, so that my English comprehension and vocabulary will improve in time. Being able to type super fast, getting some traffic, and finally having to share my own thoughts and opinions, were just pluses. For me, these blogs are like my kids. They give me happiness whenever that feeling of having unaccomplished something occasionally sinks in. Having written at least 1000 posts for my first blog, despite the college work, social and org life, and tutorial sessions that I had to balance, keeps me in check and makes me confident that I could write for other clients too. What will discipline and good work habits do to me? The decision to apply good habits in your life would dramatically enhance the quality and quantity of what you finish every day. Eventually, you will become one of the most successful people in the field. When you are able to concentrate, you can do a lot of things. Like seriously, you can accomplish a lot! When you are able to finish an important task,your self-esteem, energy, and enthusiasm is affected positively. It makes you feel like you want to continue doing it. Failure to complete your day-to-day tasks, on the other hand, uses up your energy, enthusiasm, and self-esteem. When you're able to do something significantly impacting for you, no matter how hard it is, you are able to experience a surge in energy and well-being. You feel satisfied with life. However, if you work on a not-so-important task, you get less contented and more disappointed of yourself. You'd feel that there's no payoff doing something that really doesn't matter to you. For me, writing was a way to unleash my inner thoughts. It helped me relieve the stress, and in doing so, made me a lot more stronger and fulfilled in life despite the hurdles. Disciplining yourself to concentrate on a job until it is finished boosts your confidence, mastery of the specific task, and competence. It turns you into a hardworking person and gives you self-control And when you have self control, you'd feel that you have the power to shape your own destiny. Do you remember when you were still little and the world seemed like a limitless universe of possibilities? Back when making friends didn’t give you waves of crippling anxiety and you actually looked forward to school? You can probably remember some bits and pieces, like how you’d stay outdoors until your mom yelled for you to come home, or maybe when you and your friends would play childhood classics like ice, ice, water, langit lupa, bahay-bahayan, flying saucer or patintero with a seemingly infinite supply of energy that would put the energizer bunny to shame. Often, childhood is the part of our lives we look back to with frivolity and enthusiasm. Everything just seemed bigger, brighter, and maybe even better back then. While we all eventually have to grow up, there are some childhood habits that are too good to let go of—like snacking, for example. Let’s take a quick trip down memory lane and revisit our childhood go-to playground snacks which we still much on even this day. Ah, the one that started it all. While Chippy became your favorite inuman/tagay snack of choice as an adult, it will definitely go down in history as one of your introductory snack foods. First introduced by junkfood superbrand Jack ‘n Jill in the 60s, Chippy is pretty much the OG (Original Gangsta) or the Beast of Pinoy chichiryas. It’s staple salty taste and irregular rectangular, sometimes folded, shape is recognizable anywhere, and is probably the most well-known Pinoy chichirya to date. While it originally satisfied us with its Barbeque (red) and Chilli & Cheese (blue) flavors, Chippy has expanded its selection over the years and now includes Beef & Chilli (orange) as well as Garlic & Vinegar (green). With its ultra thin texture and variety of mouth-watering flavors, Piattos is probably the closest we will ever get to making junk food that's as good as Pringles. Definitely one of the best-tasting chichiryas out there, Piatos’ trademark hexagonal shape didn’t just set it apart from all the other chichiryas in the store. Its sharp edges probably poked your mouth more times than you’d like to admit (not that it stopped you from eating though). At present, Piattos comes in 5 flavors namely: Cheese, Sour Cream & Onion, Nacho Pizza, Roadhouse Barbeque, and Roast Beef. Just the mention of these flavors makes you crave for one! Pretty much, if we were to compare the years Pinoy junk foods have existed, Chiz Curls ends up in the grand parents' club. It's simply lived a long time!. 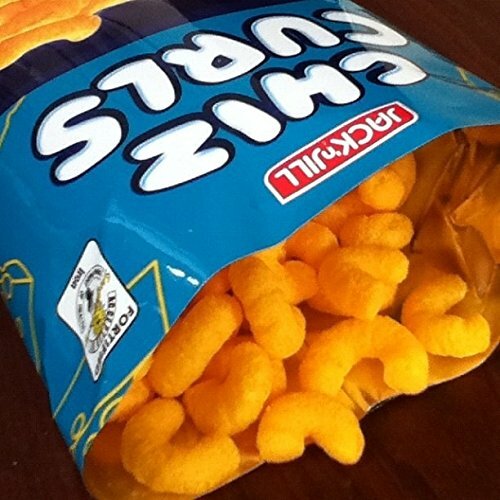 Nobody else does cheese snacks quite like cheese curls. They melt in your mouth! The spongy, semicircle curls covered in layers and layers of cheese powder will always have a special place in our hearts—especially since it was the only popular chichirya which had free stuff inside the packaging. Chiz curls didn’t get much attention until they started including pokemon stickers in every bag at the height of Pokemania in the late 90s. Eventually, it succeeded and became a mainstream snack for middle schoolers everywhere. Does anybody else think the current Chiz Curls mascot looks like a budget Powerpuff girl? The biggest irony in the realm of Philippine junk food is that Clover Chips snacks look absolutely nothing like clovers. Rather, it resembles a deformed, cheesy red blood cell. But what Clover Chips lacks in aesthetics it definitely makes up for in taste. Clover Chips has a lightweight crunch that just sets it apart from everyone else. Of course, most of us wouldn't forget those days we just sucked on our thumb and index fingers covered with Clover Chips powder. Although it comes in two other flavors (Barbeque and Ham & Cheese), nothing beats the original Cheese Clover Chips. A childhood staple and harder to find nowadays, Roller Coaster was a sought-after among kids because it was food you could actually play with—they fit right over your fingers! Remember when you used them as a ring because it's fun to do it while eating? While Roller Coaster originally came in just one flavor, it didn’t stop people from buying them by the dozens. The thin rings had just the right amount of cheese powder and crunch that was addicting. Just add Coke or Royal in your afternoon siesta, and voila, your day is complete. Since then, Roller Coaster has released three new flavoors to add to the roster namely: Barbeque, Sweet and Spicy, and Samurai Curry. 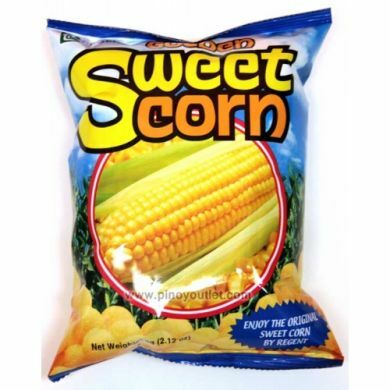 If your playground crush wasn’t totally impressed by your tsinelas-throwing and lata-hitting skills in tumbang preso, another corny alternative would be to give her a pack of Sweet Corn. Or just open one, and be surprised how your school bus mates would just troop towards you for that yummy snack. It doesn’t matter who you are, where you’re from or what you do (get that 90s Backstreet Boys reference? ), everybody loves the perfect taste Sweet Corn. Plus, there's no need to munch on it! You can just let it melt in your mouth. Sweet Corn is what you eat when you want to convince yourself what you’re eating isn’t unhealthy, cause technically it’s corn. But then you remember nothing that tastes this good could possibly be healthy, so you spiral into denial. All these chichiryas still continue to complete seemingly gloomy days and help making bonding moments among friends, family members, and partners. While it's advised to stay away from junk food, sometimes these are just what you need --- the comfort food Pinoys will always love. P..S. Do look forward to a post on at least four (4) more - Rinbee, Moby, Tomi, Peewee, Ri-chee, and Snacku! 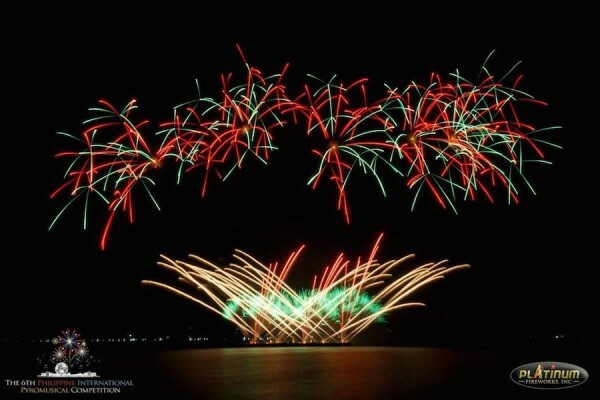 COOL | Fireworks display in Manila? Watch the 2016 Philippine International Pyromusical Competition scheduled this February and March! We all love those sparkling fireworks booming outwards in the sky. It always reminds us of how great it really is to have lived in the 21st century. Beginning on February 13, 2016 -- that's a Saturday -- the skies of Manila Bay will, once again, be lit as the 7th Philippine International Pyromusical Competition (2016) commences. 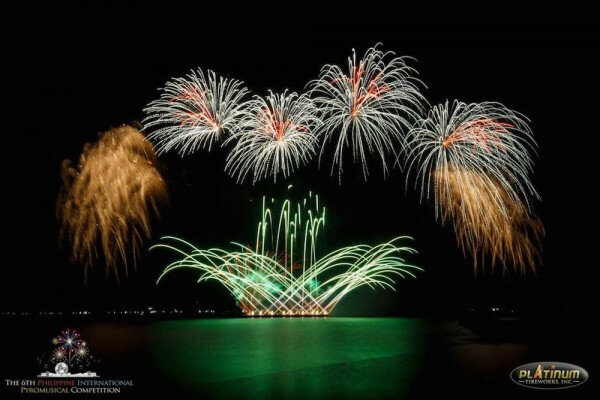 Dubbed as the country's longest-running pyromusical competition, this one of a kind event will definitely draw crowds from all ages. Participants from across nations will be converging in the country to showcase their creative fireworks. The 7th Philippine International Pyromusical Competition (PIPC) will commence on February 13, 2016, The final show and the announcement of winners will then be on March 19 (Saturday). It will be held at the seaside area of SM Mall of Asia (MOA) in Pasay. Check out the schedule of the 2016 PIPC (fireworks competition) below. Please take note that each date's first and second shows are set to happen at around 7:30 PM and 8:30 PM, respectively. Also, promo deals are offered by MetroDeal as of the moment for a 40% off on all PIPC tickets. 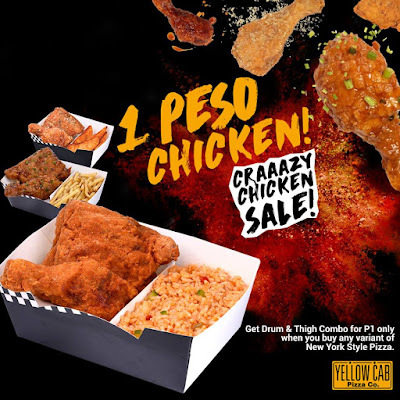 Contact MetroDeal via (02) 434-7477 or (02) 216-1988 for more information. 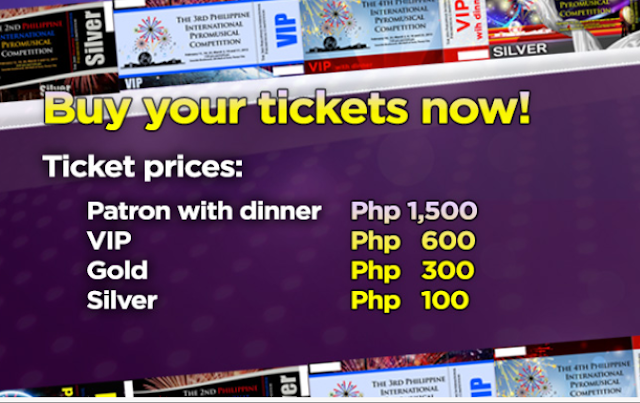 For ticket, sponsorship, and other inquiries, do visit www.pyrophilippines.com or email pipcticketing@yahoo.com. I recently saw this video by Youtube channel AsapScience which gives you tips on how to study, scientifically proven by researches. If you are experiencing difficulty in studying, these tips might be of help to you. 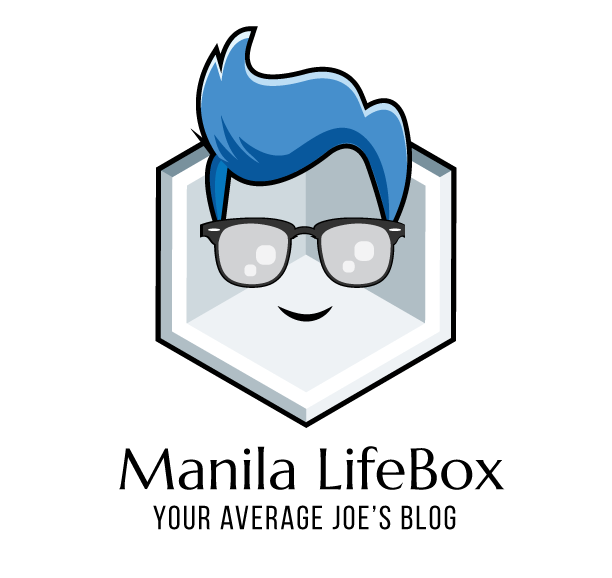 The video entitled 9 Best Scientific Study Tips details how you can best learn and enjoy studying. In case you want to know the summary of the video, here are the 9 study tips that can help you effectively study and ace your exam. 1. Study sessions are most effective in small short chunks. Spread out the whole accumulated period of your study sessions into shorter 20-to-30-minute sessions. Reason: Brain can better encode information into the synapses in short, repeated sessions vs. one mega study session. 2. Forget the cramming practice and all-nighters. It leads to getting low grades and may negatively affect your memory and reasoning for up to four (4) whole days. 3. Plan out a specific period dedicated only to studying, may it be a certain afternoon hour per day or per week. Reason: It primes the brain by setting a routine which your brain will get used doing. 4. Rereading your notes or highlighting them is ineffective. It doesn’t improve your comprehension of the topics, nor does it tie concepts together. Instead, use flashcards. They’re proven excellent reinforcement tools. Check out Brainscape.com for its excellent flashcard platform. 5. Have a specific goal for each study session. Would you like to focus on practicing how to solve the math problem in one session? Or would you like to focus on understanding the basics first? If you can’t explain it simply, then you don’t understand it well enough. 6. Every time you study, put in your mind that you’re expected to teach it to somebody else. It’s more effective versus simply thinking it's all part of a test. When you’re expected to teach, your brain organizes the knowledge that you get into a more logical, coherent structure. 7. Practice makes perfect! Always keep practicing! Practicing increases your confidence, thereby leading to a better performance. 8. Find your own study spot and equip it with all the study tools that you need. Just like setting specific study periods, this primes your brain for studying. Leave the playlist, especially when it’s filled with lots of popular songs. The rhythmic music produced distracts you. 9. Keep your phone out of reach and out of sight! Whatever happens to your phone significantly lowers your concentration.